Northern Ireland is a marvelous, natural golfing destination! Leading the pack are the famous championship courses of Royal Portrush and Royal County Down. However, there are challenging courses to be found in all corners. It’s time to leave the hustle and bustle and enjoy the unrushed golf, hospitality and friendliness of the Northern Irish. Day 1 — Arrive in Northern Ireland and make the scenic drive to the shore of Dundrum Bay and the seaside town of Newcastle. Free time to explore this historic area. Day 2 — This morning you play a course with few peers, the challenging Royal County Down GC. This championship, seaside course is one of the most admired in the world for its beauty, a test you will enjoy. Day 3 — Depart this beauty spot and continue north. You may want to explore the Downpatrick area, home of the Irish patron saint, St. Patrick. The coast road affords truly spectacular scenery. Day 4 — Your next venue, Royal Portrush GC, dates back over one hundred years and is the first Irish club to host the British Open. This course is characterized by narrow, curving fairways, small streams and a relative absence of sand-traps — definitely a challenge! In your free time visit the Bushmills Distillery to sample the famed whiskey! 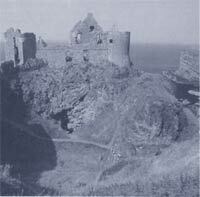 Also nearby is Dunluce Castle and the Giant's Causeway, an odd formation of rocky pillars rising out of the sea. Day 5 — Golf this morning on Portstewart GC recently redesigned. Seven new holes were opened in the huge sandhills behind the first green, adding a new dimension to the course. It is now, arguably, vying with Royal County Down as the finest course in Northern Ireland. See if you agree! Day 6 — Time to depart for your next adventure! You will be delighted with this beautiful city. The center is for walking with many Victorian and Edwardian buildings, the City Hall grandly dominates the main shopping area. You can base yourself here for a couple days and enjoy sightseeing, shopping and golf! The is just one of the challenges you can tackle.